After two and half months living under my father’s roof with nine other relatives, my wife and I closed on our new house in Gladstone, Michigan late last week. Through the help of family and friends made at the small church we have been attending, the furniture and boxes got moved in on Saturday. However, the process of unpacking each box has taken a considerable amount of time this week, and along with working on the yard that has been neglected for some time, it was hard to fit in a cigar review. 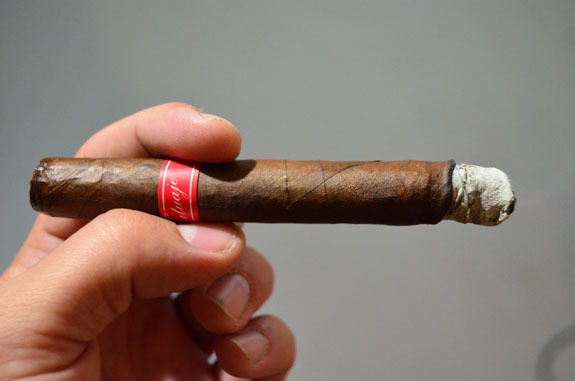 But at the last minute, I squeezed in a review of the Tatuaje Havana VI Lancero for your reading pleasure. The Havana VI Lancero is only available in the limited production lancero sampler featured in the picture above. 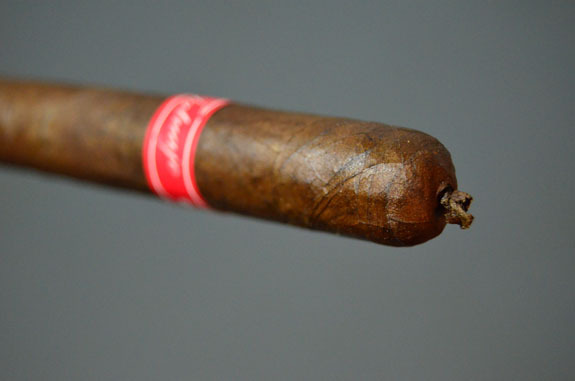 The sampler features 10 highly acclaimed cigars from Tatuaje all in a 7 ½ by 38 Lancero vitola including Tatuaje (Brown Label), Tatuaje Havana VI, Tatuaje Black Label, Cabaiguan, Cabaiguan Guapo, La Riqueza, El Triunfador Original, El Triunfador, La Casita Criolla, and Fausto. 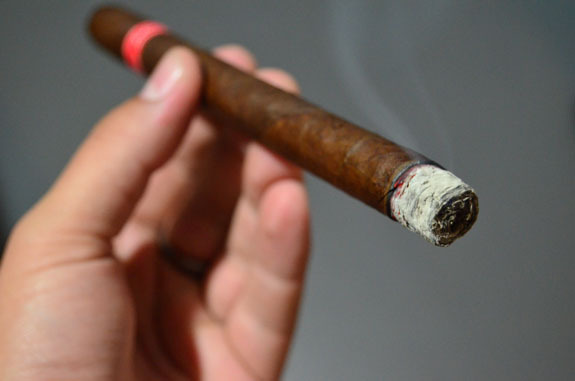 At the start of August, I reviewed the Cabaiguan Guapo lancero, which can be found HERE. 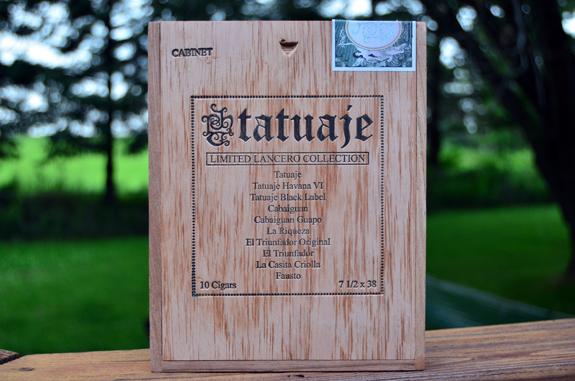 Tatuaje’s Havana VI is produced under the direction of Jamie Garcia at My Father Cigar S.A. in Esteli, Nicaragua. Here is a list of other avalable vitolas in the line: Verocu No.5 (4 by 40), Angeles – Petite Corona (4 5/8 by 42), Victorias – Corona Especial (6 by 38), Hermosos – Corona Gorda (5 5/8 by 26), Nobles – Robusto (5 by 50), Gorditos – Toro Grande (5 1/2 by 56), Artistas – Torpedo (6 1/8 by 52), and Almirantes – Churchhill (7 by 47). 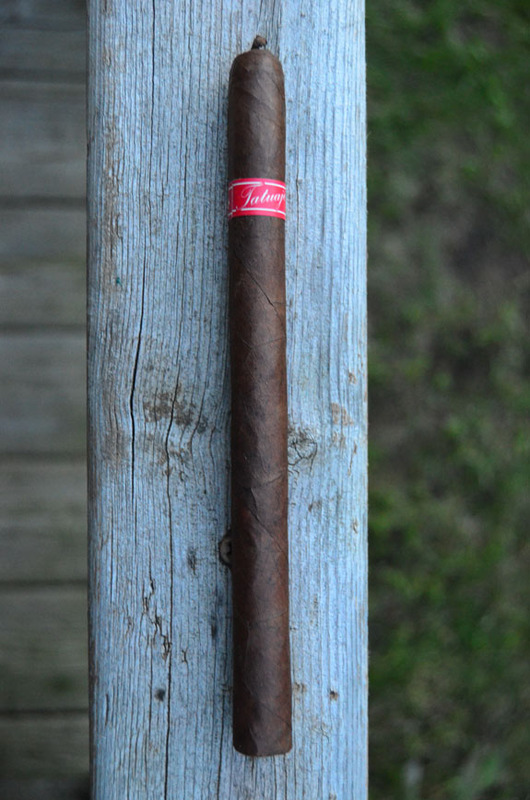 The Tatuaje Havana VI Lancero is dressed in oily Ecuadorian Habano wrapper that is milk chocolate in color. It has been a while since I smoked a cigar from this line but I do not recall the wrapper being so dark. The simple red band jumps out against the dark leaf that is scarred with small, black veins that crisscross down the stick. 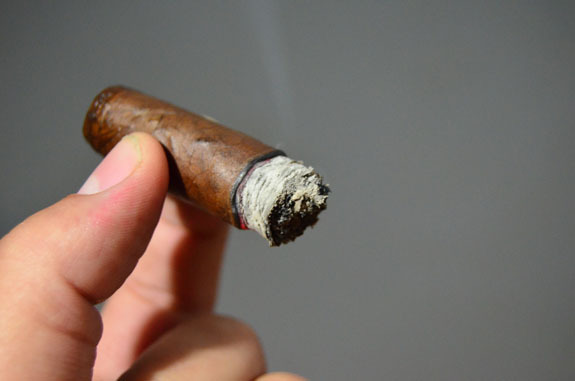 The Havana VI gives slightly when pinched but feels evenly filled. The wrapper aroma is big and bold with notes barnyard and manure. I am met with some spice as I smell the foot of the cigar with additional notes of earth and cedar. A triple cap comes to an end with a small pig-tail that gets the job done but nothing to write home about. Clipping through the 38 ring gauge stick is quick and painless, giving way to a somewhat firm cold draw that brings forth rich cedar and clove. 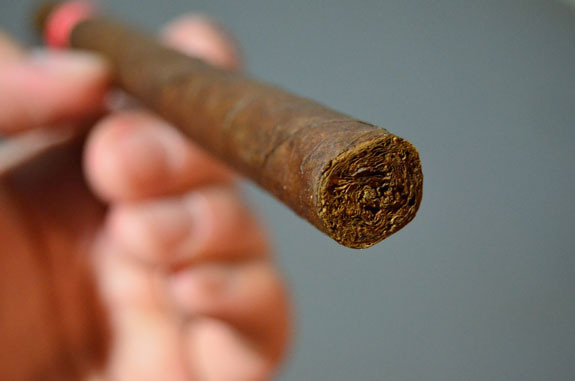 The cigar opens up with full flavors of cedar and pepper awakening my palate. The Ecuadorian Habano wrapper is really shining through with a significant amount of spice heat. There is a unique finish to the smoke that makes me think of bubble gum once it loses its flavor. The smallest of draws delivers a mouthful of smoke that is thick and chewy in the mouth. A light colored ash is dropping every half inch. At the close of the first third the perfromance has been spot on with a thin eye-liner burn. At the thirty minute mark, I have run into what may be a major issue going forward. A tunnel is forming that has cut down the smoke production and put a damper on the flavors. The profile has taken a shift to much more earthy notes and has also increased in richness. The burn-line has gotten a bit out of whack and I can’t seem to keep the cigar burning. The tunnel is now having an adverse effect on the flavors resulting in some charredness. Finally, with three inches remaining, the tunnel has come to an end but the flavors have not fully recovered. What I assume to be a result of the multiple relights, charred notes are dominating the profile. The earth has developed to diesel-like flavor and the finish of the smoke is of chocolate. The charred notes are masking the potential of the final third, which is very dissapointing. The spice is still prevalent and has turned from a pepper spice to more of a jalapeno spice. As I begin to put a close to the cigar, I notice a very appealing aroma from the smoke of tart cherries. 2014 has been a year of tunneling cigars for me. It seems that every couple of cigars I smoke have had a tunneling issue. Having on the opportunity to only smoke one of these, I cannot give it a fair assessment due to the major tunnel that was encountered. I have smoked several other cigars from Tatuaje and I rarely find any issues with quality/performance. 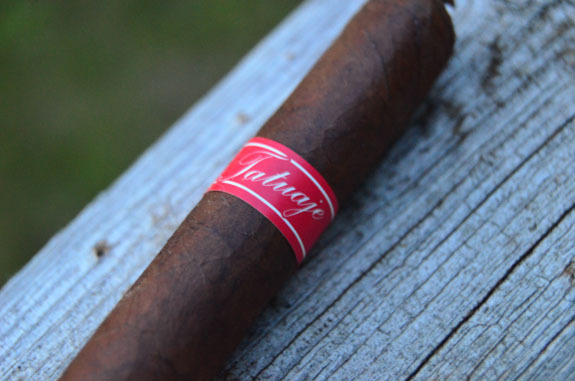 The Tatuaje Havana VI Lancero began with a bang, opening up with full flavors that were balanced and spicy, but that is where the fairy tale ends. The final two thirds became a story of bad performance and poor flavors. Knowing the high quality of Tatuaje and My Father cigars, this cigar has not deterred me from hunting down one more Havana VI Lancero and giving it another shot.